The problem with most vegetarian lasagna, in my opinion, is the water released by the vegetables which leads to a soupy end product. I’m also not a huge fan of big chunks of vegetable in my lasagna. So I like to chop it all down and cook it long and slow until it’s free of excess moisture similar in texture and appearance to, well, meat. The long cooking process also adds a lot of flavor so you don’t need much of anything else besides pasta, sauce and cheese. This lasagna happened to coinside with the making of my latest batch of tomato sauce. I know it’s not fair to talk of tomatoes out of season, or to toy with people who don’t have time to spend a day (or two) making sauce, but if you do… there’s nothing quite like it. This particular batch of sauce was my best to date. I made it with the Early Girl tomatoes I canned back in September. In years past I’ve always made my sauce with San Marzano canned tomatoes, and they are the gold standard used by great Italian cooks around the world. But just for fun I used the sweet and tangy Early Girl “slicing” tomatoes. Because they contain more of a gelatinous middle than plum varieties it took longer to cook the sauce down to the right consistency, but what I was left with was amazing. The sauce was so bright-both in flavor and color. All that said, canned or jarred sauce will do just fine for this recipe. *I made this lasagna very thin in a big dish because that’s how I like it, and that’s why it only serves 4-6. You could use a smaller dish and make it thicker. It’s also thin because there isn’t much in there besides vegetables and cheese, and that is the point of this lasagna. Could you add ricotta or cottage cheese and thicken it up? Sure. 3 cups (720ml) good quality tomato sauce–not plain tomato puree, but prepared sauce with onions, garlic, herbs, etc. **If using regular lasagna noodles, there’s no need to boil them. Put them in the lasagna pan and cover with boiling water for 5 minutes. Drain and set aside. No boil noodles can be used as is. Add all the vegetables and garlic to a food processor and pulse until they are uniformly and finely chopped–stop short of turning them into a paste. You might need to do this in batches if it doesn’t all fit in the bowl. If you don’t have a food processor you can chop the vegetables by hand. Heat the olive oil over medium heat in a large skillet. Add the vegetables. The vegetables will seem a bit overwhelming at first, but they will cook down. Cook, stirring frequently, for 30-40 minutes until all of the water and juices have evaporated and the vegetables are starting to color. Preheat the oven to 350F/175C degrees. Add a few tablespoons of sauce to the bottom of the dish and spread it around until it lightly coats the bottom. Bake the lasagna for 30 minutes or until things are bubbling, the cheese is golden brown and a knife passes easily through the pasta sheets. Serve hot. 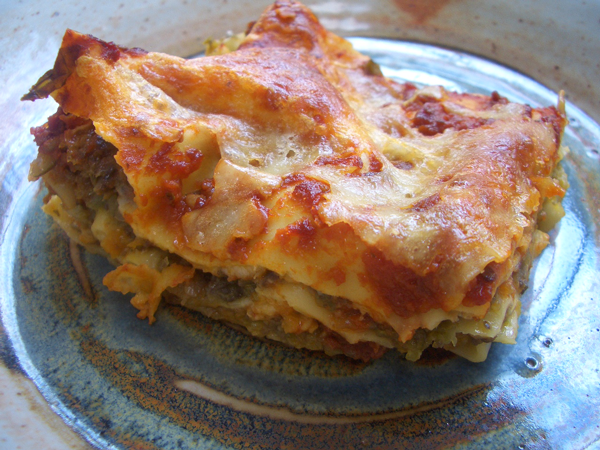 If freezing, freeze the lasagna uncooked and allow for a longer cooking time.